Help us recruit Daryl Hanna as MAPs spokesperson for the Mangroves! This is a petition needing your supportive signature to 'draft' Daryl Hannah into being the voice of the mangroves! Ms. Hannah as the mermaid from Splash has that coastal wetland connection making her the ideal candidate to speak for the mangroves. Mangroves cannot speak for themselves, and too often we at MAP can only reach a small number of people at any one time. A more well-known person, such as Daryl Hannah could reach millions of people, whom we really need to motivate to help MAP in our ongoing efforts to save the mangroves. And, the mangroves need such a vibrant spokesperson and conservation activist to raise awareness for this globally important and threatened marine edge ecosystem. Mangroves support a wide array of endangered species, including the Royal Bengal tiger of the Sundarban, proboscis monkeys, spotted deer, sea turtles, a myriad of marine life from shrimp to fin fish, crabs to manatees, flocks of migratory water birds to monitor lizards. Mangroves also support traditional peoples along the coasts of Africa, Asia and Latin America, providing livelihoods and basic essentials for countless fishing communities who are now struggling against an incoming tide of unsustainable development, threatening both their lives and their cultures. Mangroves are also vital in the fight against climate change, sequestering nearly 25% of the Earth%u2019s carbon. They also provide a living buffer against rising sea levels, ocean waves, hurricanes and even tsunamis. Mangrove Action Project needs Darly Hannah to help us reach more people and to speak as the voice for the mangroves which otherwise cannot speak for themselves. Help us draft Darly Hannah as our spokesperson by signing our petition today! Thank you for your interest and support of the Global Insular Conservation Society (GICS), a 501(c)(3) Corporation, where our vision is "Preserving Species and Habitat Through Education, Conservation and Research". Edgar Fortune, President and CEO of GICS has entered into a partnership with Dr. Samuel Gruber, Lead Scientist and Owner of the Bimini Biological Field Station (BBFS) to conduct a field based research project aimed at benefiting the endangered Bimini Boa (Epicrates striatus fosteri). The planned date for the project is 2010. Before we can help a species like the Bimini Boa we must first do our best to understand them; know their habitat, range, population numbers, sensitivities, adaptability and susceptibilities. Only through sound research can we give such a species an effective voice in the face of progress. One that will speak confidently, eloquently, and accurately to the impacts further development will have on their species survival. Animals are being counted, populations estimated, individuals are weighed, measured and fitted with transponders to better understand their range and territories. Snakes in general present a unique challenge to researchers in that they do not feed daily like most other animals and reptiles. A snake can go weeks and in some cases months in-between feedings making it very difficult to conduct a census and making radio telemetry studies on those that you do find all that much more important. In partnering with BBFS, GICS offers extensive expertise in working with snakes and hopes to help further this research and help in the efforts to save this and other species threatened by the ever expanding foot print of man. Your contribution will help support our efforts in raising $12,000 to fund this project. Without donations the Bimini Boa will most likely fall to extinction without so much as a footnote in history. All donations are appreciated. If you would like to make a donation or more information about the Endangered Bimini Island Boa please contact Edgar Fortune at edgarfortune@islandecosystems.org. Urgent Appeal For Halt to Mangrove Destruction at Bimini! This is a follow up letter to one i sent earlier urging him to take a stand to protect Bimini's shores. It seems that in the last month of waiting for your action in regards to the illicit clearing of mangrove wetlands at Bimini Island, there has been no meaningful action taken to halt the destruction there. Also, I have received word that you have taken no action in defining the boundaries of the promised Marine Protected Area. So, in essence, nothing has changed except the further despoilment of Bimini progresses without interruption. Is this then your intended "action" in this regards? Are you then complicit with the loss of the island's mangroves and all the life that this ecosystem supports? We at MAP are disappointed in this lack of interest on your part to take any corrective action in regards to the ongoing loss of Bimini's invaluable mangrove wetlands and consequent deterioration of the marine habitat there. What kind of MPA is your government planning to finally protect there, when you are allowing through your very inaction the loss of the most valuable attributes that make that MPA designation meaningful? Is it right in your mind to make a sham of your own Prime Minister's stated intent to create that MPA? Does Mr. Ingraham not himself feel some disappointment in this lack of authority, lack of respect for his word that this whole situation entails? It was reported last month that you blamed your underlings for the problems of badly managing the development issues there at Bimini, but this time you were duly alerted in February, and still you could not act effectively or in a timely manner. I would say the buck must stop at your door this time, Mr. Deveaux! Will you please act now to manage the intended MPA at Bimini and save what is left before future generation in your country are robbed of any meaningful semblance of what Bimini was and is meant to be? 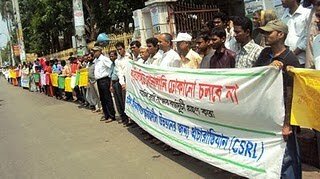 Speakers in a Human Chain and Procession in Khulna stressed for an order from Government to prohibit saline water intrusion in the agricultural land for shrimp farming towards longevity of the coastal embankments and sustainable agriculture in Coastal Zone of Bangladesh. They also demanded to undertake Comprehensive Agrarian Reform Programme to foster country's development with equity and justice. Humanitywatch along with other more than 29 organizations including Saline Water Protesting Committee, Association of Landless People and Dacope Citizens' Committee organized the program under Campaign for Sustainable Rural Livelihoods (CSRL) on 1st April 2010 in front of Khulna District Council. Hundreds of landless farmer, agricultural labour, political leaders, civil society representatives, non-government organization leaders and professional association leaders participated in the program. The human chain chaired by educationalist Professor Jafar Imam and conducted by humanitywatch chief executive Hasan Mehedi. Humanitywatch along with members from Ganges Floodplain Agroecological zone AOSED, CDP, Dhrupad, EFADF, Ideal, IDF, Jago Nari, JJS, Khalifa Foundation, Ledars, Locos, Muktir Alo, NSS, PGUS, Prodipan, Progoti, Rupayan, Saco, SPS, Sodesh, Uddom and Campaign lead Uttaran organized the Human Chain and Submission of Memorandum with active support from BELA, Nijera Kori, Dacope Nagorik Parishad, Lobonjol Protirodh Committee and Bhumihin Sangathan. The speakers said, the agriculture and livestock of coastal zone already have declined due to excessive saline water intrusion by cutting the embankments for brackish water shrimp cultivation. Situation of poverty has reduced in all of the regions of Bangladesh except the southwest coastal zone due to shrimp cultivation. Some people become rich with the shrimp, but millions of people become poorer from the poor. The largest mangrove forest, Sundarbans, also destroyed due to denuding its buffer zone and adjacent agroforestry trends. The farmers said, the embankments weakened before cyclone Aila because the shrimp farm owners cut embankments in more than hundred places, installed more than 3 hundred illegal sluice gates, and more than 3 thousand 7 hundred pipes in the embankments. So, they are solely responsible for collapsing the embankments in cyclone Aila. With collaboration of Bangladesh Water Development Board (BWDB) the shrimp farm owners are still trying to stop rehabilitation of the embankments, they complained. According to the Integrated Coastal Zone Management Plan (ICZMP) and Manual of BWDB, brackish water shrimp cultivation is totally prohibited in some polders. Moreover, the Supreme Court has ordered the government to protect cultivable land from saline water in its judgement on 15 February 2010. But the shrimp farm owners ignored all laws and regulations, the civil society leaders said. The speakers urged the government to implement 8 point demand including implementing Comprehensive Agrarian Reform Program (CARP), banning industrial shrimp cultivation in agricultural land, dismantling all illegal sluice gates, pipes and cuts, punishment of responsible persons for damaging embankments, compensation from shrimp farm owners for social and environmental loss, distributing Khasland and common water bodies to the landless common people, amendment of Embankment and Drainage Act 1952, adoption of a new Embankment Management Policy with options of participation, tidal river management (TRM) and joint management etc. Among others Jalal Uddin of Nijera Kori, Mahfuzur Rahman Mukul of BELA, Agriculturist Tayyebur Rahman of EFADF, Alamgir Islam Lablu of SPS, Deb Prosad Roy of Locos, Abu Hasan Bakul of Muktir Alo, Khalid Hossain of Rupayan, SM Solayman of IDF, Swapon Kumar Das of Dalit, Habibur Rahman Kabir of NEEDS, Mamunur Rashid of Juba Nagorik Samaj, Farmers' Leader Abdul Jalil, Kader Mollah and Arnika Dhali, Amiya Das, Atiar Rahman and Jahanara Begum of Labonjol Protirodh Committee, Chitta Goldar and SA Rashid of Communist Party of Bangladesh, Rafiqul Huq Khokon of Jatiya Samajtantrik Dal, Manirul Huq Bacchu of Biplobi Communist Party, Dr. Samaresh Mondal of Workers Party, Shariful Islam Salim of Humanitywatch and Hasan Mehedi of Aila Durgoto Sanghati Mancho addressed the participants. Please click on the links to see the news.